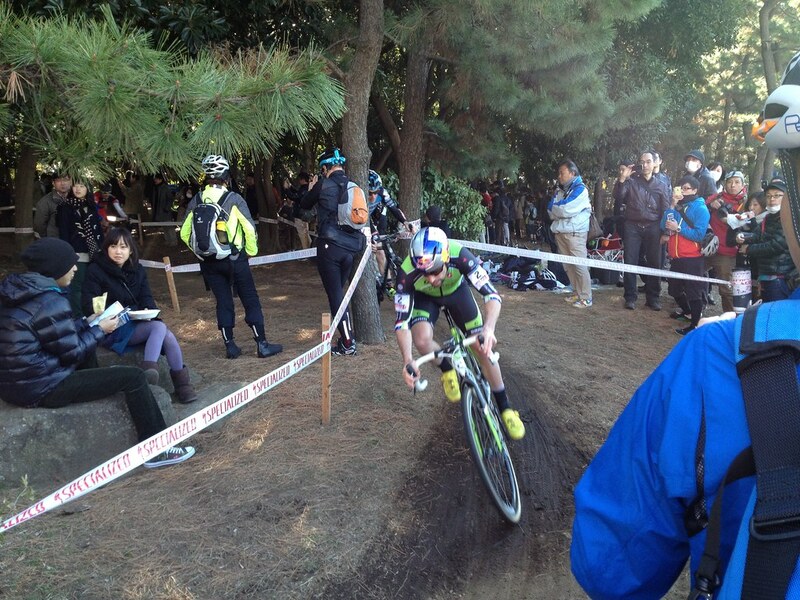 Since meeting Chandler and Tim at Cyclocross Tokyo last year, I’ve taken the liberty to clog their inboxes with rants about ‘cross, Tokyo, and bikes, and stalked both of their racing seasons. I sent a lot of emails with exclamation marks. I met up with them at the Gran Prix of Gloucester. They kept telling me that “yeah, yeah we can’t wait to go back to Tokyo,” but a part of me doubted they would make the flight over after Louisville. I mean, isn’t going to sleep for a week with an ice cream IV the natural thing to do after Worlds, not run off to race again, in Tokyo? 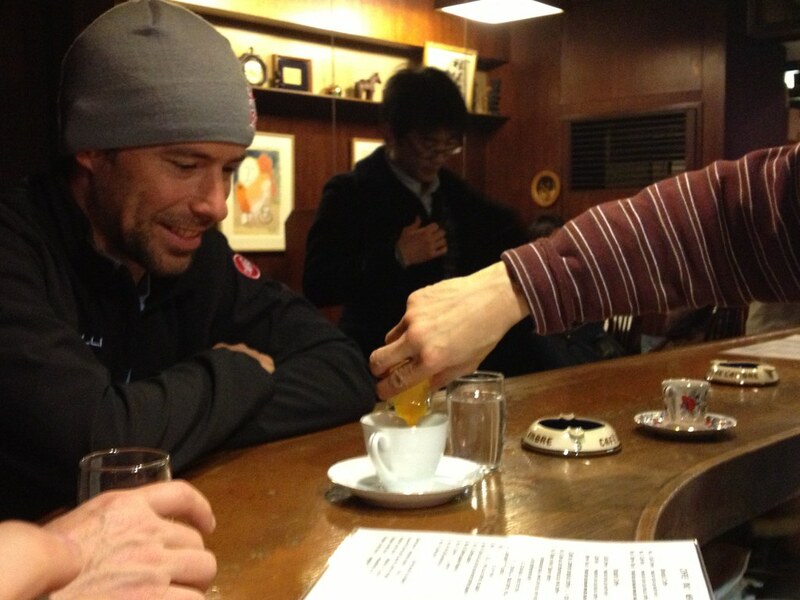 But last Friday two Fridays ago, I was sitting in a bar in Ginza with Tim, [Rapha-Focus mechanic]Tom Hopper, and [Rapha-Focus team manager]Jeff Rowe, having a beer at 3pm. We sandwiched coffee at Café de L’Ambre [where Tim had a café oeuf, a meticulously poured-over coffee with a raw egg yolk in it] between the watery beer and a stop at a whisky bar, and thus started the weekend. 24 hours later, I was cheering on Chandler in the Cat 2 race on the same course that the pros would be racing on the next day. Lined up pretty much in the last row, Japandler moved his way steadily up while Tim, JF [a Boston friend of Tim’s, in town for business], and I screamed and yelled. We all tried to shame Chan into at least beating the guy on the Surly Pugsley, until we realized that that guy was beating everyone. Well, until he rolled his tire and had to switch to a regular ‘cross bike [“oh, that guy that was riding everything?” Chan would later say]. 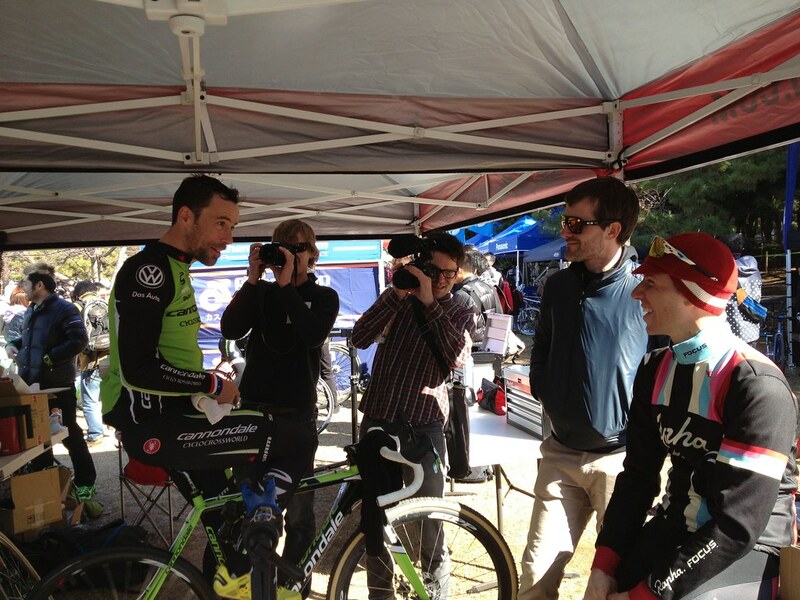 Chan came in 4th, and I got to play podium girl for the first [and last] time in my life. 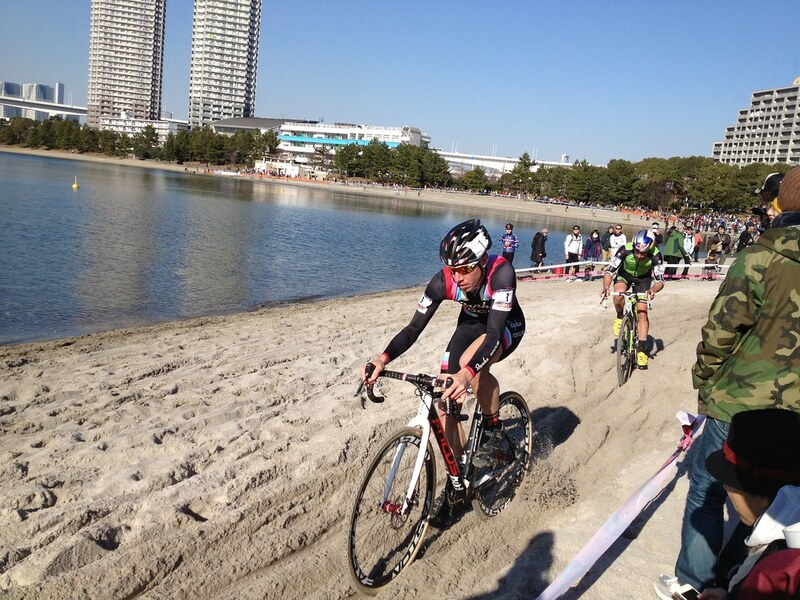 I only really found out how much sand was actually involved in the course after JF’s masters’ race the following day. There was the long stretch of sand that was there last year, but this year an additional beach section was added, presumably to allow for more spectating space. A pavement sprint led right to a wide curve along the beach [a few guys endo-ed as they hit the sand], before the riders raced through the twists in the trees. A small ramp added some excitement between the wooded sections, before a descent back onto the beach, into sand that seemed to swallow front wheels. 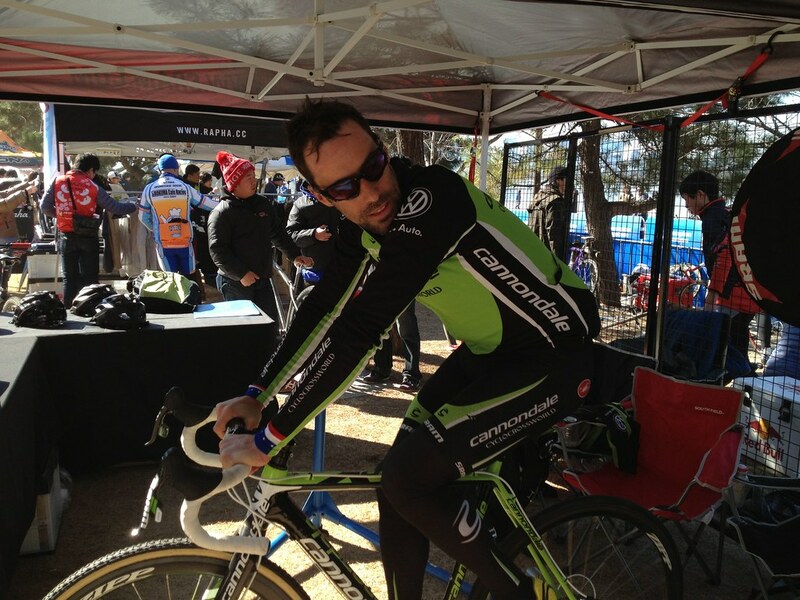 I had seen Chan ride the high line the day before, but most of the amateur field had chosen to run the sand section. 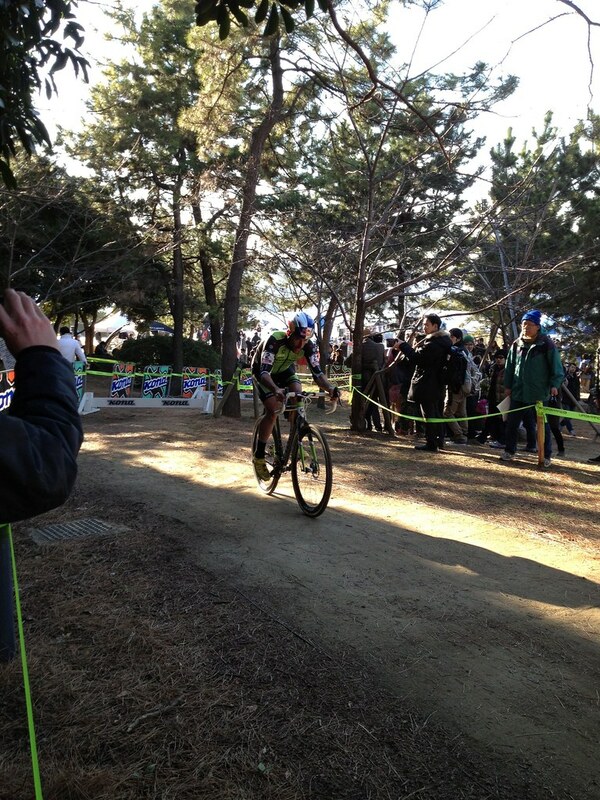 Both Chan and JF would say that it was the hardest race they’d done this year. It looked brutal. 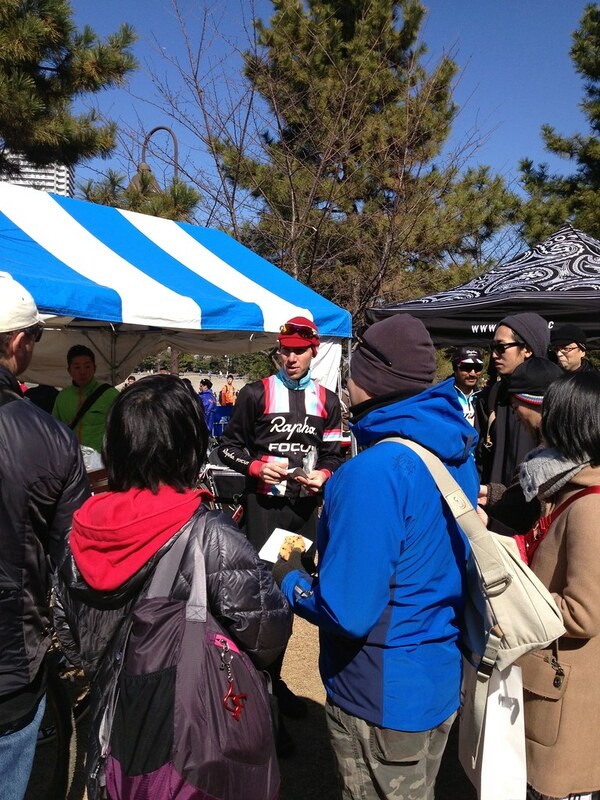 Back at the Sram tent, with the sun coming out, Tim’s primary concern was how much he would be sweating, and Jeremy Powers’ primary concern seemed to be trying to walk without stepping on a herd of Japanese fans. Arnie from Red Bull came to hang out, as did Sam from the infamous Behind The Barriers. The latter would, later that night, get footage of me weaving around the streets of Shibuya after chugging 1.5 beers with him........Yeah. I actually did a lot of weaving in and out that day. Once the gun went off, JF and I ran around the course, shooting pictures of Tim and Jeremy with our respective iPhones. 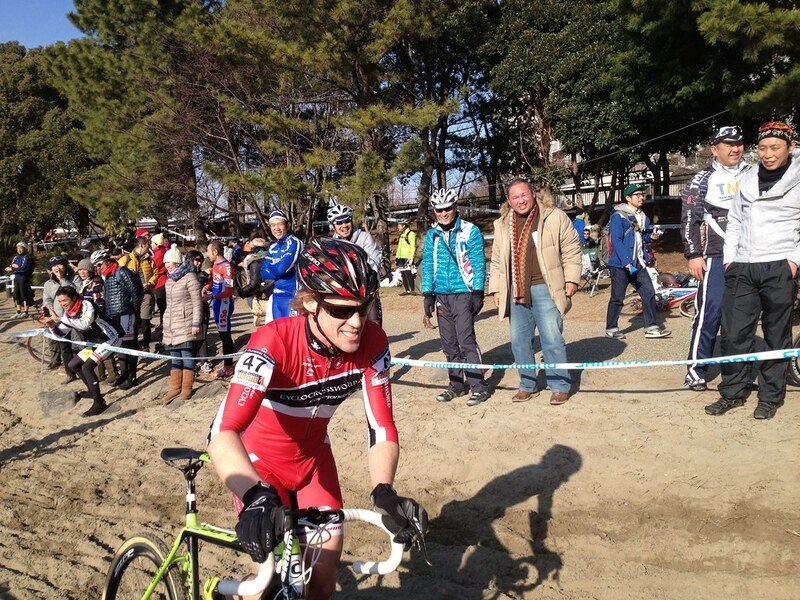 JF, having raced a few hours earlier, was familiar with the best places to get pictures, and we jumped over Shimano tape and ran through sand to cheer on the guys. 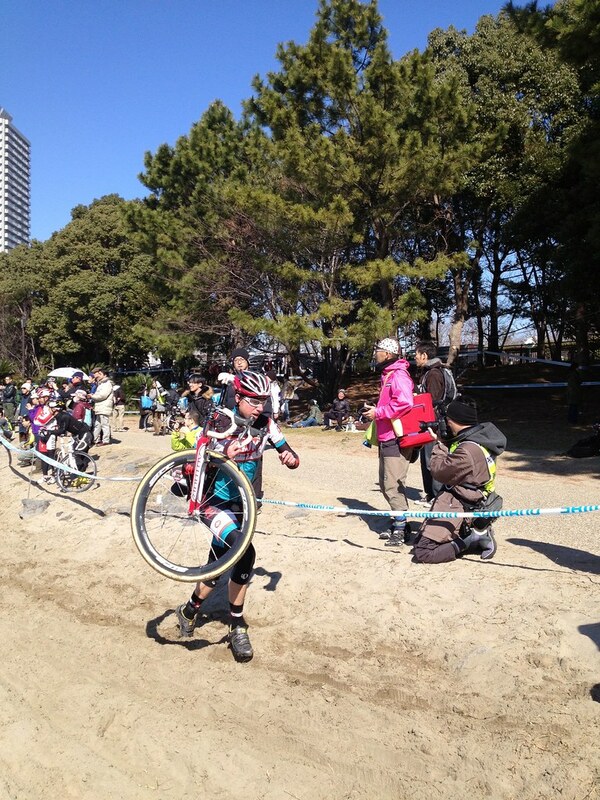 Japanese national champion Yu Takenouchi led the race just like he did last year, and flew through the sand like it wasn’t even there. Jeremy and Tim would close the gap between the trees [with Jeremy bunny hopping the barriers every single lap, to waves of cheers by the fans], but Yu would stretch it back out once on the beach. 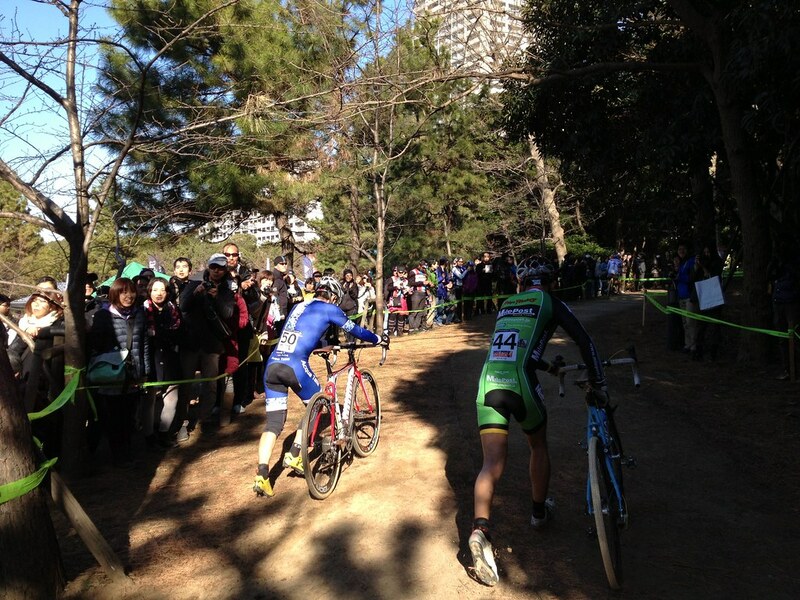 The field was getting lapped; the course more crowded. The elite field did a total of thirteen grueling laps, with Yu holding on until the last lap, when Jeremy cleaned up any hope of a Japanese win. 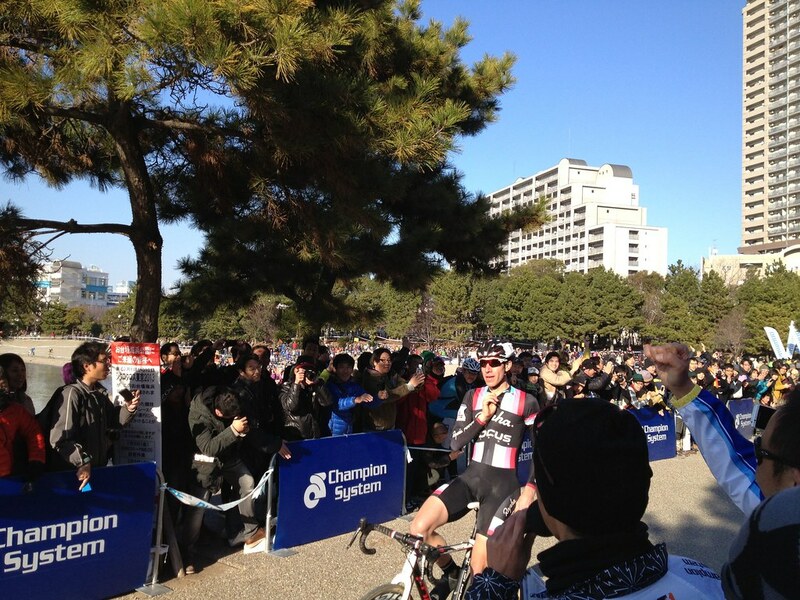 Tim claimed the last spot on the podium, and the race was done. 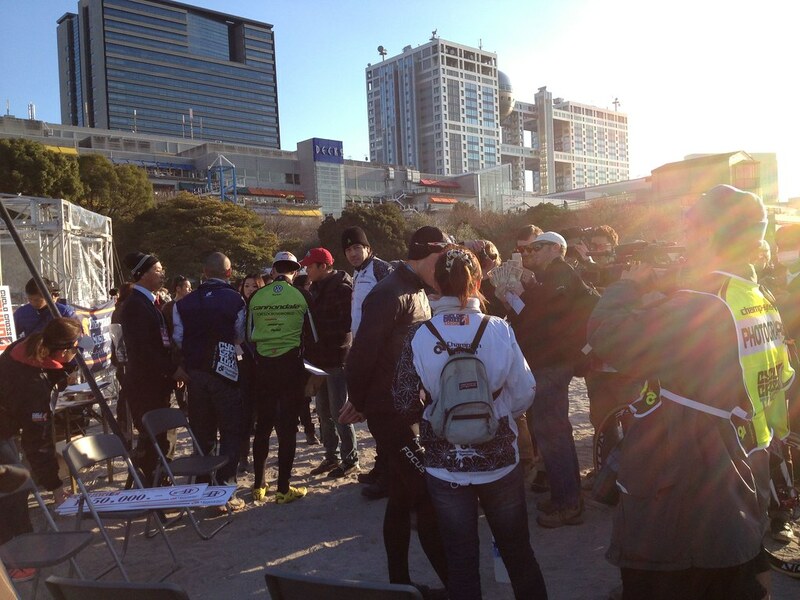 The sun was slowly setting by the time the guys finished the podium presentation and conducted quick interviews. We were all shivering in varying degrees, I finally met Alex of Sram who also worked the pit with Japandler for Tim, and I found out that Tim has these zip up tights that are like the Lycra equivalent of basketball rip-off pants [par for the course, I guess, when you’re the “Michael Jordan of the cyclocross world”]. Getting shitfaced off less than two beers and wandering aimlessly around Shibuya followed, plus some riding around town and a night with Red Bull. But more on that later.